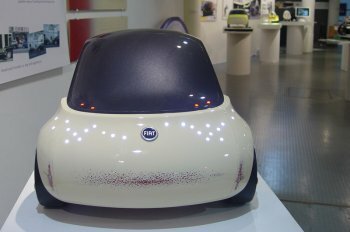 An exhibition titled Mitomacchina the History, Technology and Future in Car Design in Italy opened its doors at the Modern and Contemporary Art Museum of Trento and Rovereto in December, and will run until May. The new exhibition explores this most iconic of objects, revealing the history of car design and focusing on major innovations in vehicle aesthetics and technology. Highlights on display include the first car ever made with an internal combustion engine – the Benz Dreirad of 1886 – which features alongside great names in auto design, from Rolls Royce, Chevrolet and Lamborghini to Mini, Volkswagen and Nissan. 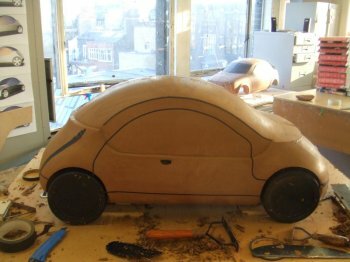 The London Royal College of Art's Vehicle Design course is also being represented in the exhibition by three 2006 graduates. 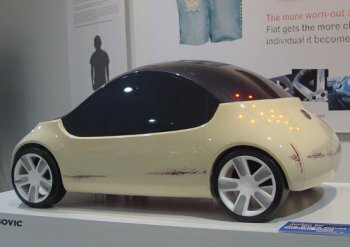 The graduates' models are being exhibited in the emerging talent section alongside prototypes of 21st Century car designs from some of the world's leading designers and manufacturers. One of those three models is Fiat 'Scratch', the result of an an innovative project by Slovenian design student Uros Pavasovic. The Fiat 'Scratch' car is designed around 'scratch happy' bumpers that wear out in style by developing colourful marks when scratched. These bumpers turn stressful, costly and unavoidable wear and tear of the car into a design feature unique to each owner's model. 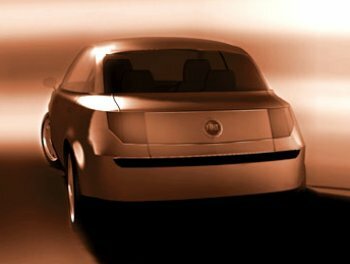 Pavasovic is also showing his model (developed in 2002) which proposes a new Fiat 128; it is being shown as part of the Italian Coachbuilders Association (ANFIA) contribution to the exhibition. Car design is one of the defining legends of the past 100 years. Through its history, much of that most revolutionary of eras, the 20th century, can be charted, and vehicle design looks set to continue to carve out an ever more crucial role for itself in the 21st. Mitomacchina opened in Trento at Mart (the modern and contemporary art museum of Trento and Rovereto) on December 2nd 2006. It offers a dual approach into the role cars have played in society and design, looking at how vehicles have been protagonists of change, both socially and aesthetically. The bumpers of Fiat 'Scratch' turns stressful, costly and unavoidable wear and tear of the car into a design feature unique to each owner's model. Uros Pavasovic is also showing his model (developed in 2002) which proposes a new Fiat 128; it is being shown as part of the Italian Coachbuilders Association (ANFIA) contribution to the exhibition. The Fiat 'Scratch' car is designed around 'scratch happy' bumpers that wear out in style by developing colourful marks when scratched. At the same time, Mitomacchina surveys the designs, industrial processes and test that have accompanied this extraordinary 'object' since its conception in the early 20th century. Running alongside this look through the vehicle's design and sociological past, the exhibition sets out to reveal the young talent that is shaping the face of future car design. Work by leading young talent from Europe's top design schools is to be represented, as well as Uros Pavasovic, it includes Johan Jonsson and Jonathan Punter, all of whom graduated from the Vehicle Design department at the Royal College of Art in 2006. The RCA is also represented in Mitomacchina by Helen Evenden, tutor in Vehicle Design and Critical and Historic Studies at the College. The writer and curator has produced an essay for the catalogue that accompanies the show, which will contemplate "the relationship and tensions between the car and the city". Evenden's piece looks at the vehicle's (often maligned) presence within the urban landscape and the equally discomforting relationship city dwellers have with the peripheral activities and regulations – from parking wardens and bus lanes to congestion and other charging, road rage and theft – that have developed in tandem with the automobile's inestimable rise. Major car manufacturers to be represented in the Mitomacchina exhibition include Alfa Romeo, BMW, Bugatti, Chevrolet, Chrysler, Citroën, Ferrari, Fiat, Ford, Jaguar, Lamborghini, Lancia, Lotus, Maserati, Mercedes-Benz, MG, Mini, Nissan, Pagani, Peugeot, Porsche, Renault, Rolls-Royce, Saab, Smart, Tatra and Volkswagen. Meanwhile, under the direction of Gabriella Belli, a steering committee of made up of leading car designers and experts in these fields have overseen the creation of the exhibition. These include Gian Piero Brunetta, Pierluigi Cerri, Emilio Deleidi, Giampaolo Fabris, Giorgetto Giugiaro, Tomás Maldonado, Giuliano Molineri, Adolfo Orsi, Sergio Pininfarina and Mauro Tedeschini.